Digital or analog, the essence of recording and production is the act of representing. One thing becomes another; one medium stores information about another. That representation can also be physical, tangible, and visible. 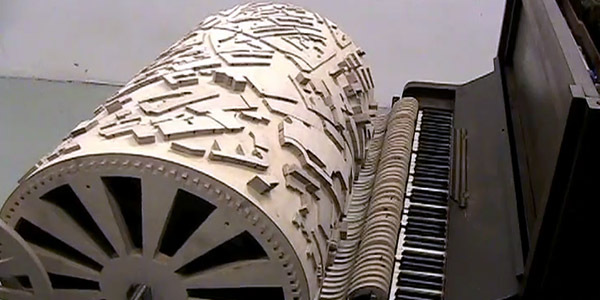 In a sculptural pianola, Akko Goldenbeld turns the Dutch city of Eindhoven into a pianola roll, so that the landscape of buildings and streets acts as a physical musical score. I think it raises some questions about whether translating the one into the other obscures the experience of a city rather than clarifies it, but that would discount the act of watching it: with the visual connected to the sound, one begins to see the topography of the resulting music. The tall buildings in the city centre have a heavy touch; the low-rise villas to the South create considerably gentler sounds. Akko Goldenbeld has a very personal way of looking at, or rather listening to the city. He has created a scale model of Eindhoven and assigned it the role of sound recorder; the buildings create a score. Placed on a revolving wooden cylinder the buildings set little hammers in motion that play the keys of a piano. And turning and turning, the city makes its voice heard: from loud to soft, long to short, high-pitched to low, traslating the urban developers’s three-dimensional reality into an aural experience. Stadsmuziek (City Music) makes you tune in to the ensemble-playing that is environemental planning.